A bit doddery and oafish, Jeremy Corbyn stumbled and stammered through his first Conference speech like a 1950s grey-bearded puritan. He was robed in a bright red tie, though the knot hung just half-an-inch too low for unimpeded consideration of his message: it’s not easy to focus on the face when the eyes are constantly drawn to the jugular notch. But he didn’t care: this was his pulpit, his chapel and his mission. He was sober and straight, and his faithful congregation clapped right on cue to the euphoric refrains of joy. But the sermon was without form, and void; and darkness was upon the face of the rest of the country. Labour’s messiah flitted from statistics to stuff, and then from random facts back to stuff, all interspersed with amorphous blurb and arbitrary stuff, most of which was apparently plagiarised from some obscure blog (ie not used without permission, but pre-published and used without attribution). That’s a bold gauntlet to throw down, but justice and righteousness demand it. It is intolerable that the British Government is not only silent in the face of Saudi barbarism, but the Ministry of Justice is complicit in the administration of the inhumane Saudi prison regime; and, it appears, the Government colluded in a “secret Saudi deal” to secure the election of Saudi ambassador Faisal Trad to the United Nations Human Rights Council. Politics that’s kinder, more inclusive. Bottom up, not top down. In every community and workplace, not just in Westminster. Real debate, not necessarily message discipline all the time. But above all, straight talking. Honest. That’s the politics we’re going to have in the future in this party and in this movement. It is a call for a new direction that we believe our political life ought to take.. Our country is hungry for a new approach to political life that will “change the political weather”.. We are suggesting the trajectory for a new kind of politics – one which works constructively with a ferment of different ideas and competing visions.. We need a new political story that will enable the people of Britain to articulate who they are, what they want to become and how they will work together to live virtuously as well as prosperously.. At this election, we can sow the seeds of a new politics.. we need new, informal and independent structures.. this may be an election that sows the seeds from which a new narrative might emerge.. If the country is ever to enjoy a new politics which reflects our beliefs about human flourishing, we must work with others to make that vision attractive.. The Church of England strongly supported The Big Society. We saw that the philosophy it represented commanded support from well beyond the Conservative party. The title of the project is not what matters. The time may not have been ripe for the ideas to be translated into practical policies. But the ideals that The Big Society stood for should not be consigned to the political dustbin – they could still be the foundation for the new approach to politics, economics and community which we seek. So, let’s be kinder and more decent to Jeremy Corbyn, as he exhorts, because with fairness and decency is how we’d all like to be treated. Try to focus on the good in his first Conference speech, despite its oratorical deficiencies, not to say a black hole of oratorical incapacity. There’s no need for linguistic art or oral flourish when you’re seeking neither to entertain nor persuade. You can fizz with his ideas, or bugger off. He doesn’t care about winning power, you see: his political principles are all. But he was right to focus on housing needs and mental health, even if he barely dedicated a whole line to what is, for many, a debilitating darkness. It isn’t much, granted; but these two points, along with the two sections quoted, shine in the gloom of an essentially Marxist thesis of higher taxes, economic intervention, more wealth redistribution and state-enforced equality. 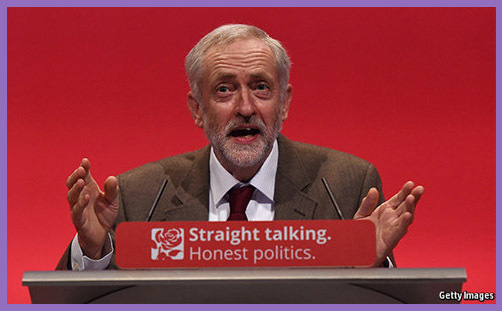 God cares about the words we use, and Jeremy Corbyn used some nice ones. If truth, honesty and grace are to supplant malign negativity of our political discourse – the slander, abuse, obscene filth, gossip, ugly blogging and Twitter hate – then this politician will indeed fulfil the Bishops’ vision “for a new approach to political life that will ‘change the political weather'”. Let no corrupt communication proceed out of your mouth, but that which is good to the use of edifying, that it may minister grace unto the hearers (Eph 4:29). Let’s see how many Labour Party members are renewed in their hearts, and how many of their supporters are transformed into the Corbyn likeness. And then let’s see how long it lasts.